This week, read about our stops from famous D.C. to infamous Flint. Tour stop 4: ArtReach, THEARC, Washington D.C. In Washington D.C. ArtReach – a museum outreach program for youth and families at THEARC, a local arts organization – demonstrated the power of a well-organized institution to bring together diverse participants who represented almost every decade of life. We met passionate professionals employing alternative modes of engagement to connect and make art. For them, the dream is about growing what they’ve cultivated and passing the torch. For example, Tara Libert works to connect prison inmates to their communities through her job at Free Minds Book Club, an organization offering a book club and writing workshop at the D.C. jail, and additional courses to people who have recently been released. Toni Ford collects stories from the elderly before they are lost, to connect generations in her “post-retirement” career at Double Nickels Theatre. Gwen Garth, founder of the Art Palace, spontaneously corralled young participants from their sidewalk play. Like many of the other creative community spaces we’d been welcomed into, the Art Palace was on the outskirts of the affluent parts of town, in an area that needs more resources, more green space, and more opportunities. But it was a highly supportive and interconnected community. One five-year-old charmed the room by announcing he’d be the “second black president” so he could make others’ dreams come true. Jan, of Inner Visions of Cleveland, offered the three of us a place to stay on the day of the workshop we hosted in her city. She lives in what’s considered locally a “good area”. The next morning over coffee, she told me about parallel roads that take people from one good neighborhood to another, never going inside the “bad area,” but only along the edge, allowing people to live parallel lives. Years ago she could no longer stand it, and simply began to walk and get inside. Everyone at the community café knew one another through their shared civic work, but in openly sharing their personal dreams they learned new aspects of what drives each person. Getting to core conversations is powerful, and the sincere discussions continued that evening at the best chicken and waffles place in the city, where Eirik and Marcus had their first taste of the cultural staple. Later, we successfully convinced Bucky to join us on the road to Chicago! Check out her reflections on joining us here. Joe Scipiani of Flint Public Art Project took us in for the night in one of the houses currently being transformed into a place for art and community. Bucky, our adventurous tag-along from Detroit, had never been to Flint, a city of about 100,000. While media portrays the city as small and problem-wrought, in reality, Flint is dynamic, historic, filled with big players vying for influence over the city’s future. The shared trauma of losing faith in the local government’s responsibility to look after people has mobilized community leaders. 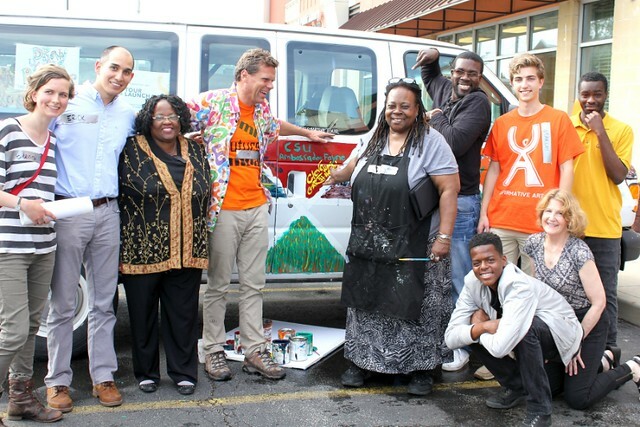 We met Flintonians at the Affirmative Art workshop at My Brother’s Keeper shelter for men. Initially reluctant to engage, the participants spoke with an open heart for more than two hours. They shared deeply about their past lives, current situations, and future aspirations. Many men wanted a simple life, reunited with their families, and to be able to positively contribute to the well being of loved ones. We posted the dreams in the common room as a solution to regulations that didn’t allow the men to take them to the sleeping area. Everyone liked having their dreams displayed. Follow the Affirmative Art tour on Facebook and Instagram. Post and images by Claudia Paraschiv. Follow her on twitter at @jellybeancity.